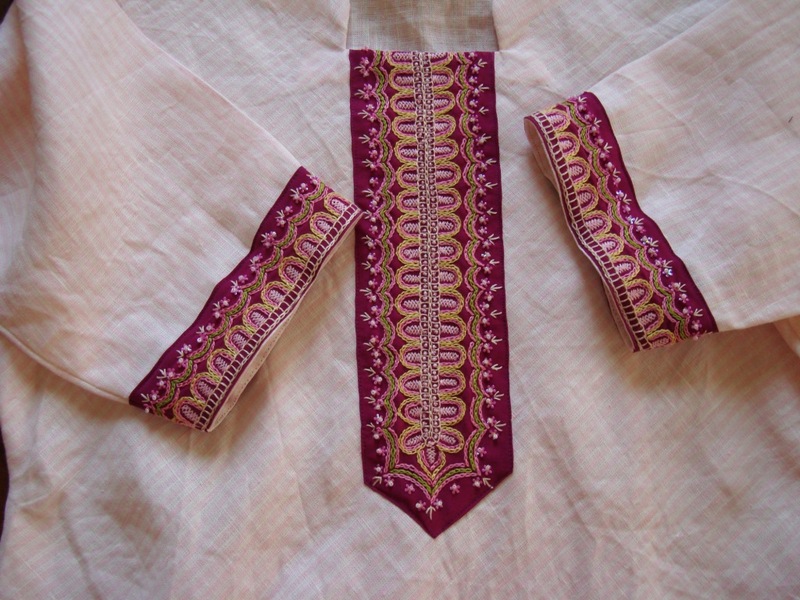 A traditional Indian motif pattern was chosen for the main yoke.The motif is repeated twice to lengthen the pattern. 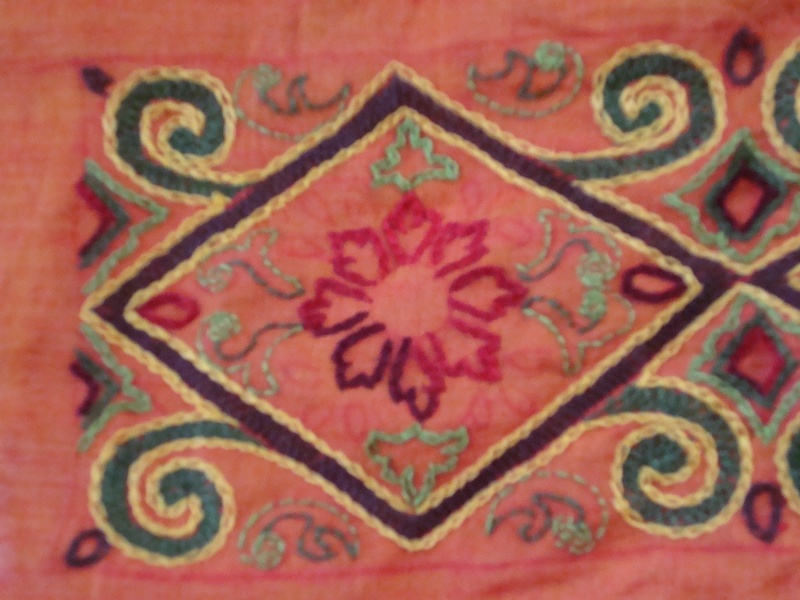 For the first time I took photos at different phases of this embroidery. 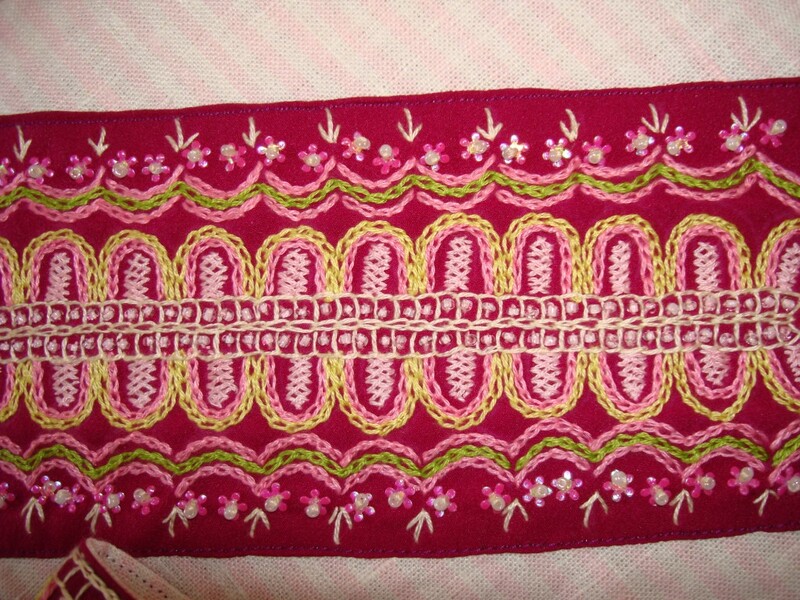 .The flower pattern is done in variegated thread. 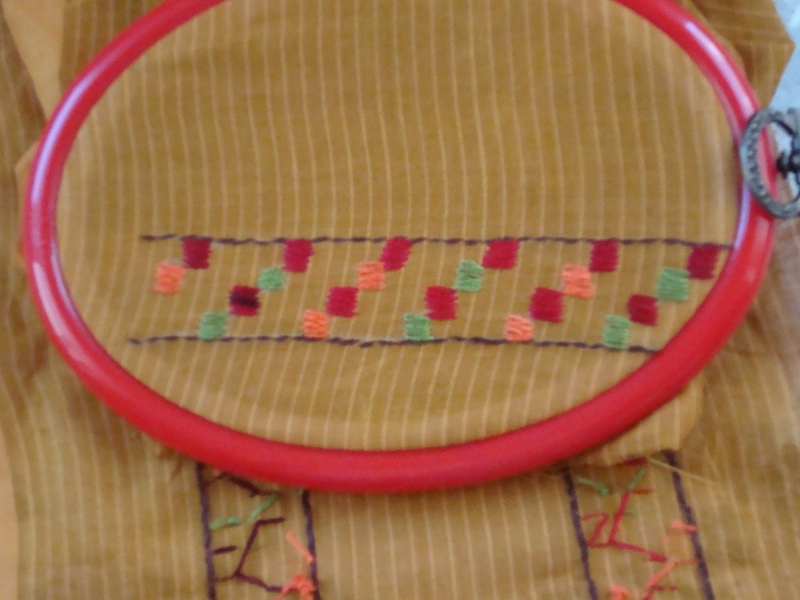 The herringbone stitches are outlined in back stitch with yellow thread. I’ ll continue with the details in the next post. 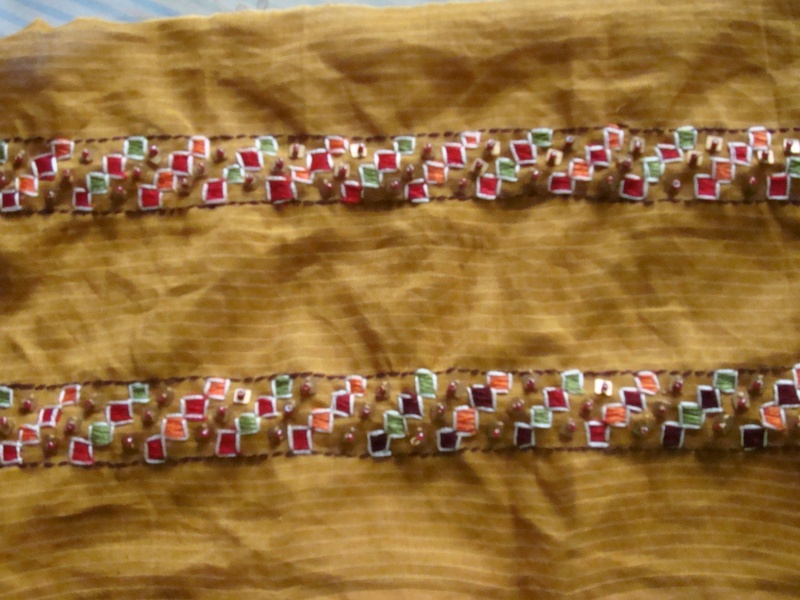 This decorative seam is part of a sleeve border for the white tunic.I made two border patterns, one in orange with just sequins and this one in golden yellow. 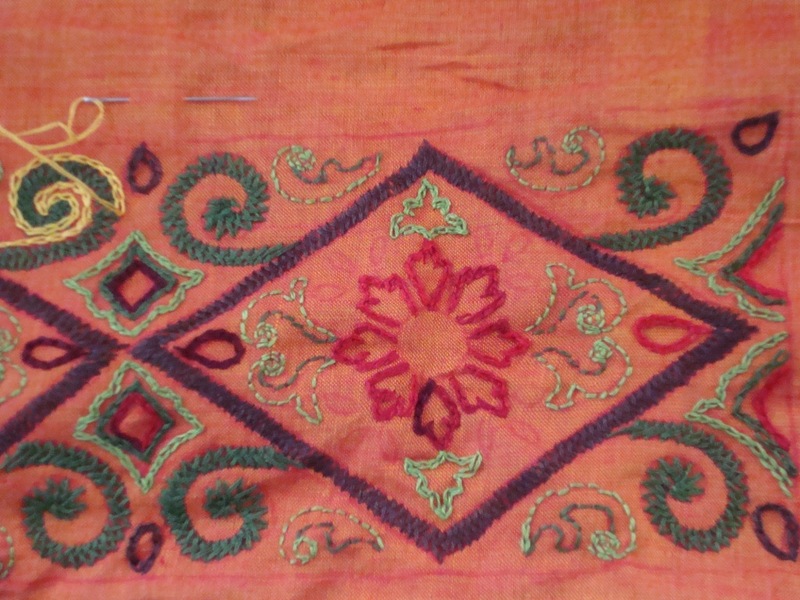 The square filling stitch is surface satin in orange, green& variegated thread. 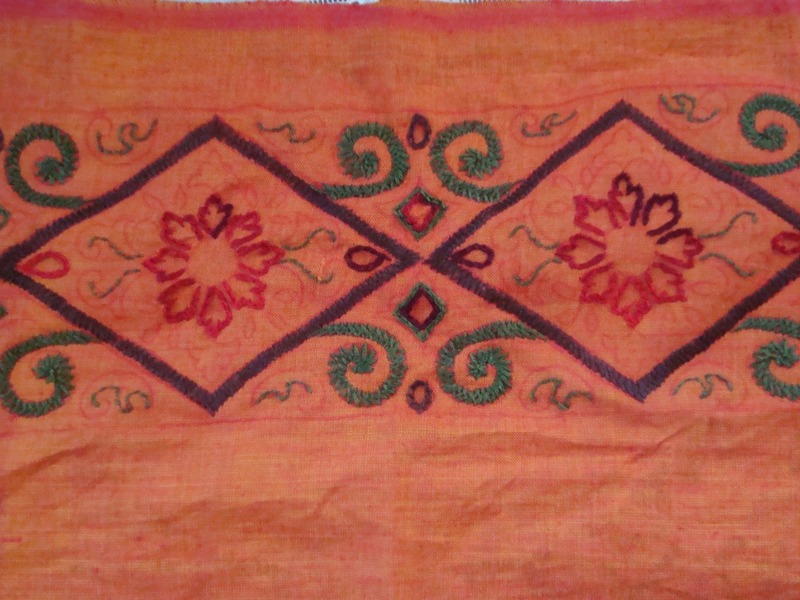 These squares are outlined with double running stitch. the yoke details on next post. 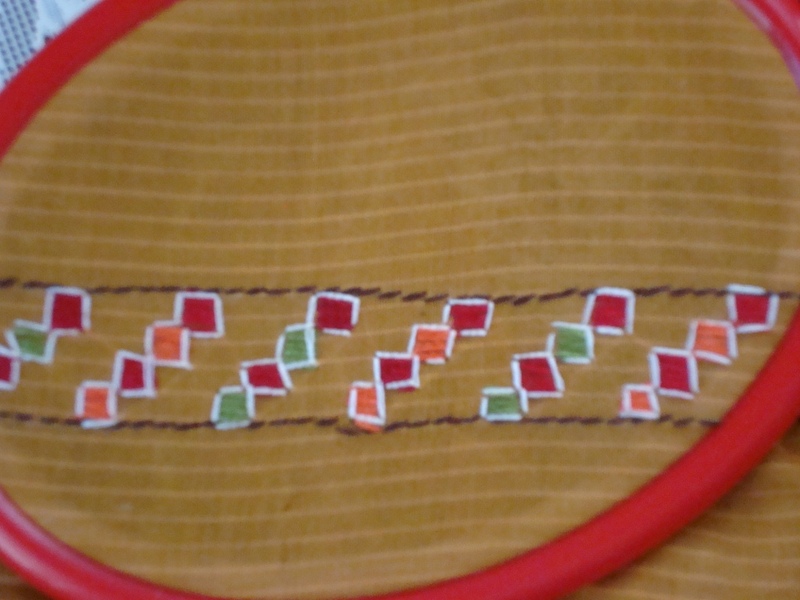 In this decorative border, I was trying to work on those stitches and colours which will not be tedious to do, and at the same time will not compromise the effect. 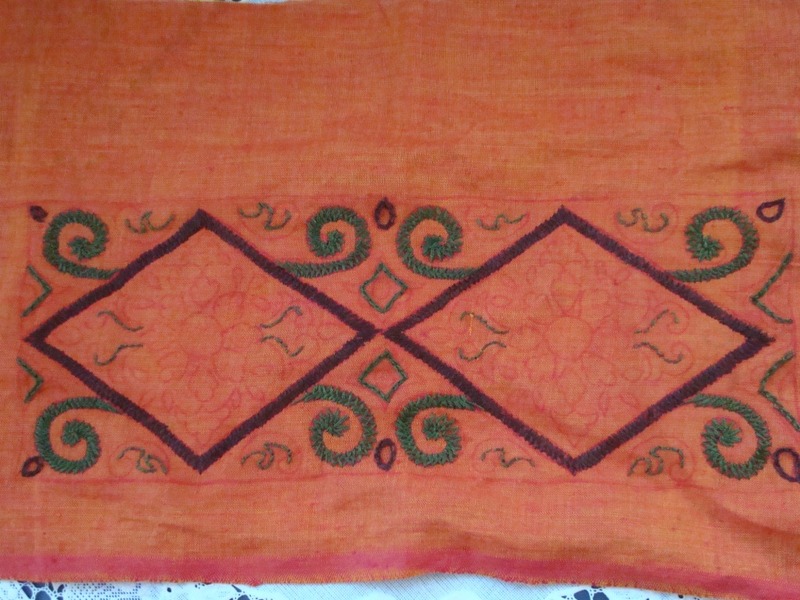 Stitches were well chosen, but colours played their part in extending the time. 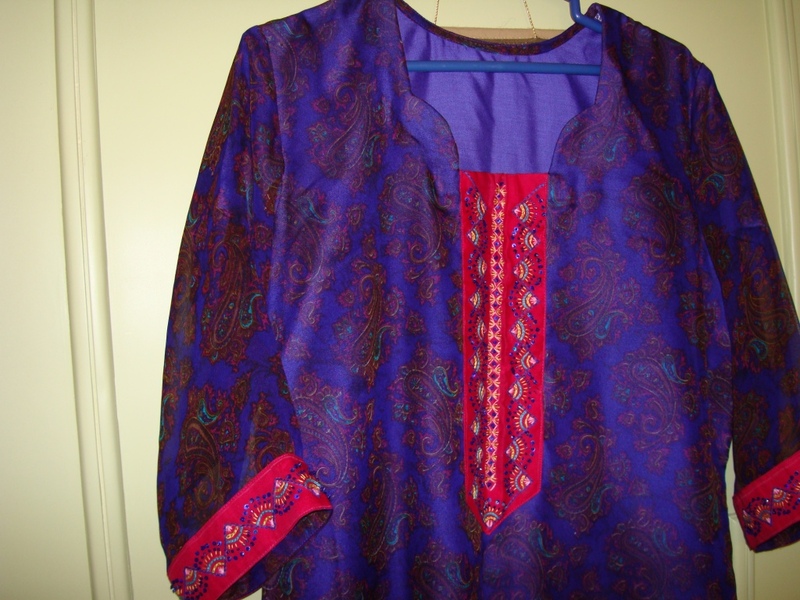 The tunic is silk chiffon in dark blue[ with violet shades]..The all over paisleys are in dark pink ,golden yellow and light blue. 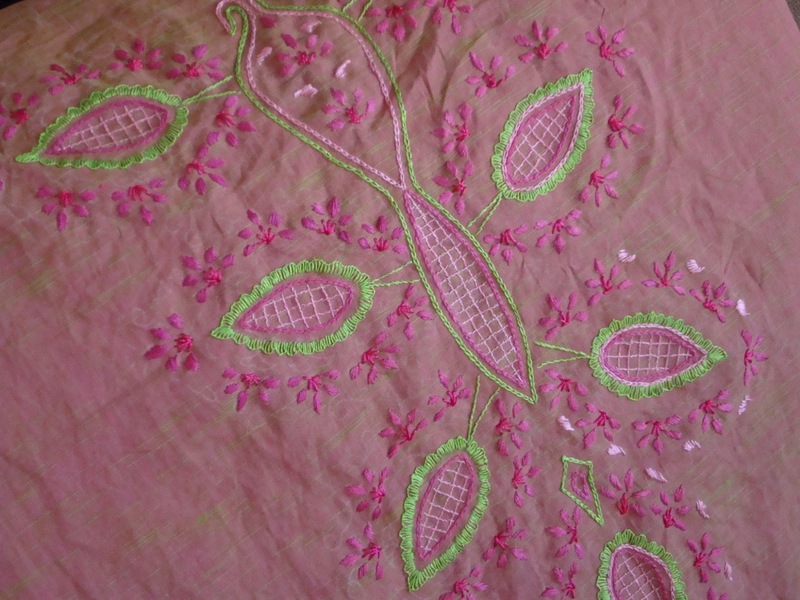 So the fabric on which the embroidery is done is also dark pink. 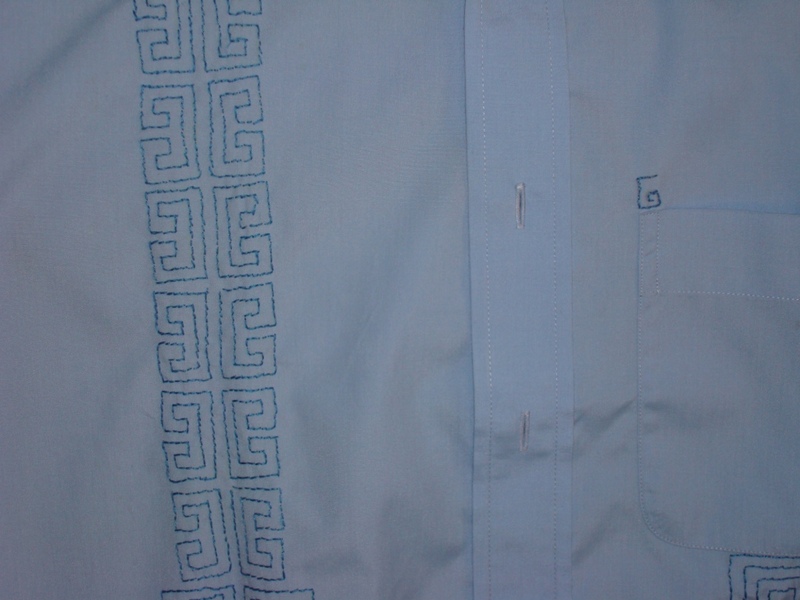 I used dark blue, yellow&light blue colours for embroidery embroidery. Back stitch,chain stitch,fly stitch, arrowhead st, straight stitch. 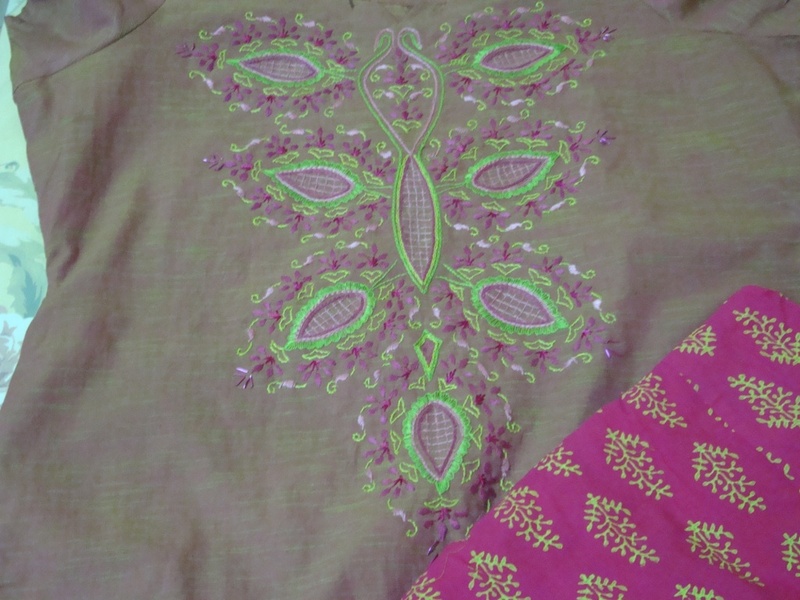 Some sequins and beads are also used for embellishments. 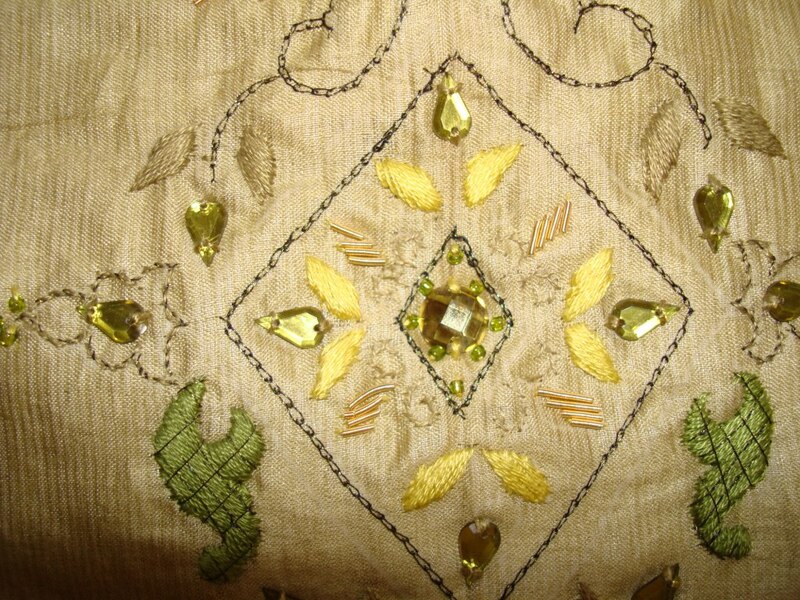 Lesson learnt-Choose better quality of sequins and beads for silk fabrics. Only then,it gives a better look. 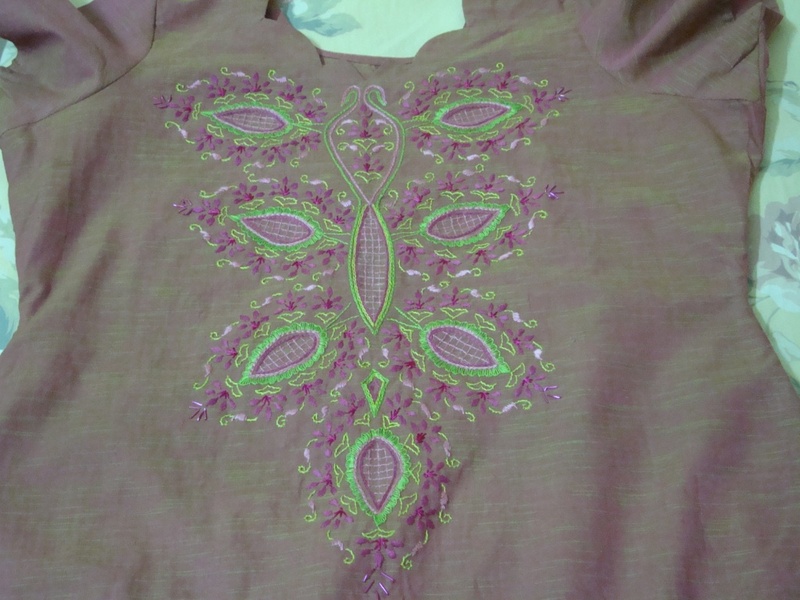 This is white linen tunic with pink stripe..
For this ,I chose a dark pink fabric for the embroidery. 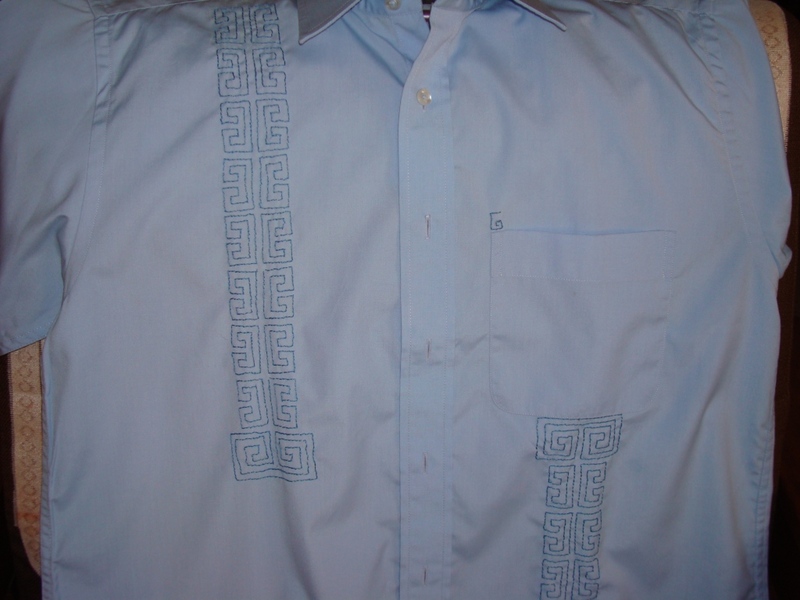 Herringbone st,chain st, buttonhole st and straight st. 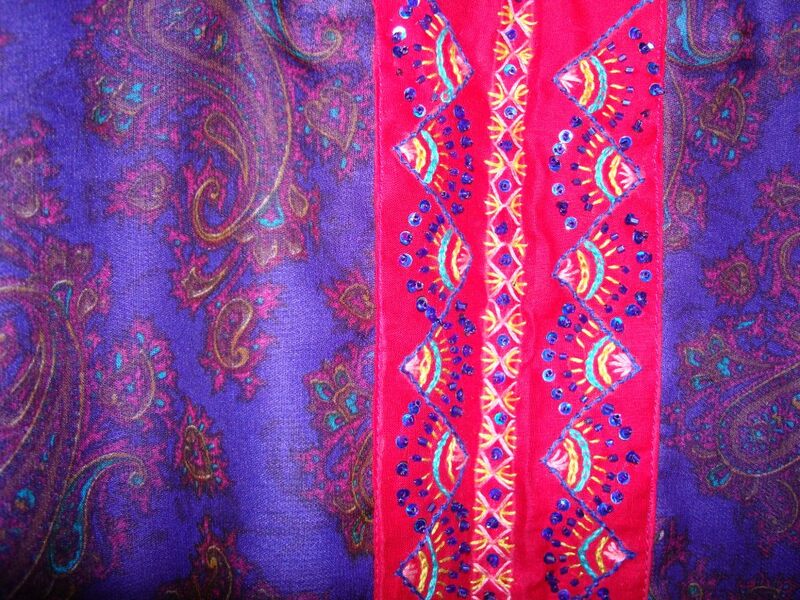 The design was a simple repeat pattern, for sleeves and yoke. Later this was embellished with beads and sequins. 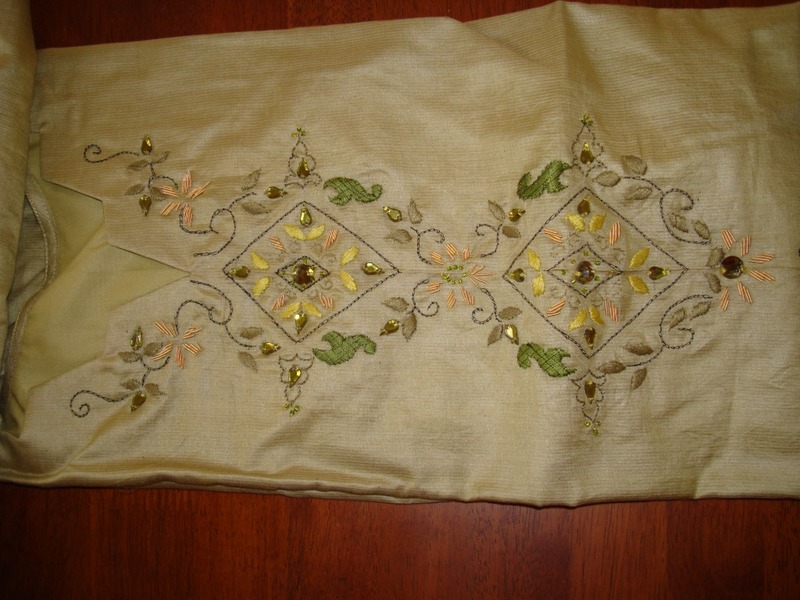 It is just a mixture of decorative seam treatments.